← UPDATED! Synergy Alberta Strikes BC! 17 groups, including BC Tap Water Alliance, join call for frac regulations! Calling for regulations gives industry social licence to frac. Has Synergy finally conquered Will Koop? CALGARY – Chevron Corp. is ramping up spending in the Duvernay shale basin, Canada’s “hottest new play,” after spending three years exploring its potential. “The Duvernay is one of the most prospective liquids-rich shale plays in North America,” Chevron Canada Ltd. president Jeff Gustavson said in a release Monday night, announcing the company’s move from exploration to commercial development in play. 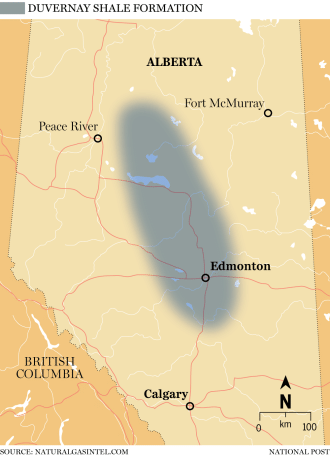 Wells in the Duvernay formation, which stretches across east-central and northern Alberta, turn up large volumes of natural gas but also high-value liquids like condensate, which is used in the oilsands and at times fetches the same price as light oil in the province. Chevron, along with joint-venture partner Kuwait Petroleum Corp., has an interest in 330,000 acres in the play and has been drilling exploratory wells there for the last three years. The San Ramon, Calif.-based producer is currently the third largest producer in the Duvernay after Shell Canada Ltd. and Encana Corp. but is about to accelerate its drilling program in the formation, sparking hundreds of millions of dollars of new spending to commercially develop a section of the formation. “They did their pilot and were very pleased with the results,” Wood Mackenzie analyst Nathan Nemeth said of Chevron. He said the company produces about 21,000 barrels of oil equivalent per day in the formation and its drilling program could boost its production there to 65,000 boepd. “We’re taking a staged, scalable approach to developing our Duvernay acreage and this is the first step,” Chevron spokesperson Leif Sollid said. He declined to provide details on how much the company would spend. Drilling wells in the Duvernay costs approximately $11 million, Nemeth said, which is expensive enough to keep smaller operators out but still down from costs of $20 million at the beginning of the commodity price downturn in 2014. Chevron could spend up to $290 million this year in the formation, rising to $380 million next year and $500 million 2019 as the company scales up to drill 46 wells in the formation, Nemeth said. “This is a big investment for them,” Nemeth said, adding Chevron isn’t very active in Canada aside from its stake in the Athabasca Oil Sands Project, now operated by Canadian Natural Resources Ltd. following their deal with Shell, and other prospective acreage in the far north of British Columbia. In addition to Chevron’s investment, Calgary-based Pembina Pipeline Corp. announced it would spend $290 million building out a condensate-handling facility, gas processing facility and pipelines to serve Chevron’s needs in the play. “We’re excited to further support the growth of the world-class Duvernay resource play and begin building out our first tranche of infrastructure requested under the previously announced agreement with Chevron,” Pembina vice-president, gas services Jaret Sprott said in a release, hinting that more spending could be on the way. For the last several years, Youngberg said, Chevron has focused on completing is massive liquefied natural gas export projects in Australia. While it owns a large position in Texas’s prolific Permian basin, acquired decades ago, it hasn’t been as active in the North American shale plays compared to its rivals.